Where can I manage my activities? You are able to create and manage various activities in bexio. 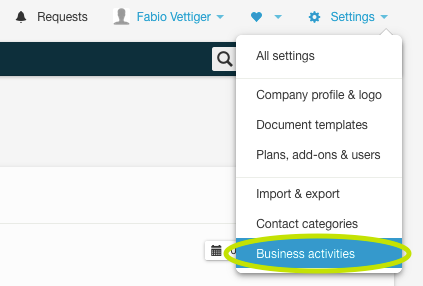 You can open the overview for the business activities under "Settings - All settings - Master data - Business activities" or directly via quick access under "Settings - Business activities". Here you can see all of the business activities you have entered at a glance. Click on the button "New activity" to enter a new business activity. In addition to the name, you can define whether or not the activity can be invoiced as standard, or whether a default hourly rate and a default income account can be defined. The defined hourly rates are then e.g. automatically integrated in the project conditions if the option "Hourly rates for activities" is selected in the field "Invoicing method". The defined standard income account is then automatically included for "Import times to invoices". Consult our Helpdesk report "How do hourly rates react (project, client, employee, activity)?" for information on how the hourly rates in bexio interact with one another. If you want to delete an activity, open the desired activity by clicking on it and press the button "Delete". 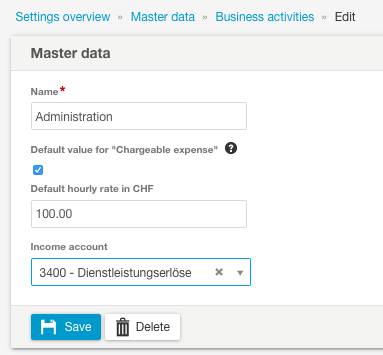 How can I synchronize with the bank: Zürcher Kantonalbank?